In response to a challenge from The Daily Post’s Weekly Writing Challenge to “detail a three to five step story or process, and illustrate each of the steps with something visual”. When I took up painting two years ago, I didn’t think still life would interest me. However, I gave it a go and found that I loved painting food. 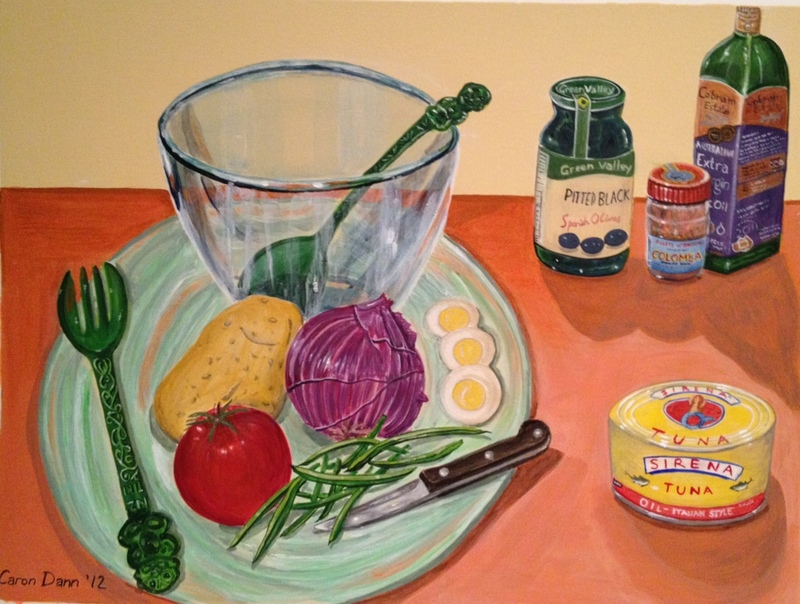 I had an idea to paint recipes: that is, to paint the elements of a recipe before they became a meal. This idea evolved to include place settings and pre-dinner snacks—anything to do with food preparation, utensils or consumption in the home, in fact. Strangely, I have painted a knife in all of them! “Cut Me” (above): This is the very first painting I did. It was with trepidation that I took up a paintbrush and loaded it with that wonderful vibrant red. I was pleased with the result, especially the way the knife turned out. It took me about 15 tries to get that reflection right! 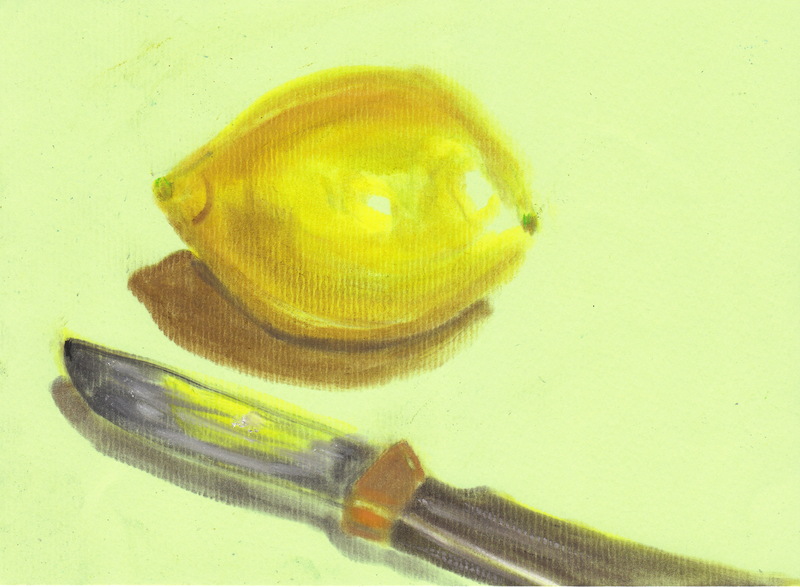 “Lemon and Knife” (above): This wasn’t really meant to be a painting at all, just a trial of my new PanPastels, which are a pastel medium pressed into small dishes and applied with sponges. This took me only about 15 minutes at the breakfast table one morning. The knife is special, as it was given to me by my late father when I was about 20. I have used it almost every day in the kitchen since then. As someone on an online art group I belong to commented: “Sometimes the simplest things are the best”. “Only On His Day Off” (above): Until recently, my husband worked evening shift five nights a week. 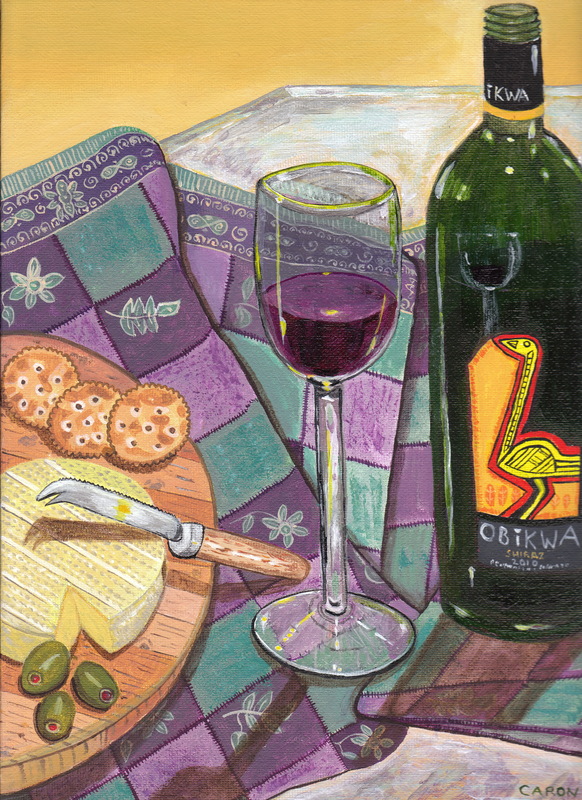 On his days off, he loved to indulge in some red wine and accompanying snacks. The cloth is one I bought from Bali when I visited in 2005. “Making Sangria” (above): the ingredients for this classic Spanish drink are peaches, oranges, lemons, red wine and soda water. The red wine was sourced from a shop in Melbourne that stocks the right kind, and it was expensive! There is also usually sugar in the recipe, too, but I thought I had enough elements already. “Making Salad Niçoise” (above): For the ingredients of this French salad I bought a Spanish onion and bottled olives, Italian canned tuna and anchovies, and Australian extra virgin olive oil. You can also add capers to this salad. I used those fantastic green plastic souvenir salad servers sent to me by a friend in Auckland, New Zealand, plus a wonderful green glass platter given to me by a friend in Melbourne, Australia. Most of my paintings contain elements that are meaningful to me. 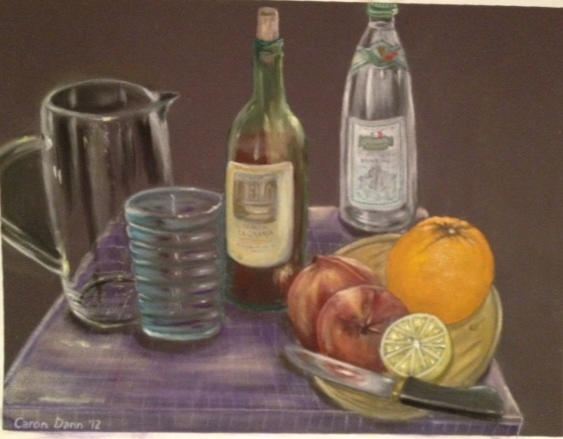 This entry was posted in Art, Food & dining, Writing and tagged acrylic painting, DPchallenge, PanPastels, still life. Bookmark the permalink. Thank you! Glass isn’t too hard for me to do, but other things are, sometimes things you don’t expect to be hard. I just keep painting over the object until it looks right. 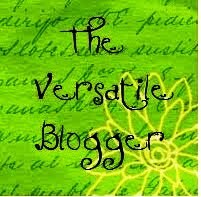 Thanks for the link—your blog is very interesting. I haven’t done much digital imagery yet, except for virtual finger painting, which I wrote an earlier post on. Good luck with everything. 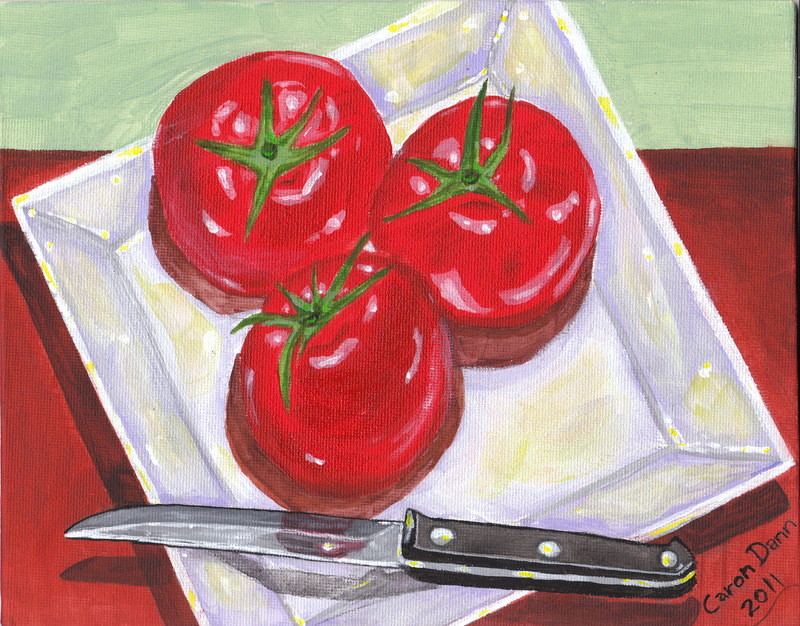 The knife in the picture with the tomatoes was the thing I really noticed – I was like: clever reflection, then I read your comment! I also thought the bowl in the nicoise picture was very well done. My boyfriend’s mum paints most weeks and this week I was admiring a glass vase she did with watercolour. I think glass must be one of the hardest things to do. Thanks for your kind comments! I always had great ideas when I was younger about what I could paint, but never could manage to realise them and didn’t think I’d be much good at it. Now, though, I’m very patient with myself, and because it’s just a hobby, I do it for enjoyment. It’s a lovely, peaceful hobby to have. I find shadows harder to do than glass. And perspective—well, I’m still learning, quite obviously!